I have been talking about my craftiness everywhere but here, so I’ll update you on what I have been up to. But first, a commercial for myself. My Lunar Eclipse Merino Roving is currently featured on the front page of etsy, so hurry over there and look (This only lasts for about 24 hours, so it might be over by the time you take a look). Thanks to chucklescentral for adding me to his/her treasury list that eventually made the front page. I’ve been a member of etsy for a year and a half and this is the first time I have been on the front page and I’m pretty excited about it. Oh and speaking of etsy, they have made a cool new little script that lets me show off the items in my shop. you may have noticed it in the sidebar on the right. I think it is pretty sharp. Etsy rocks. So what have I been up to? This is what the Central park hoodie looks like at just over one ball in. i blabbed about it over at the knitalong. long story short – love it, love the yarn. I’ve actually almost finished the entire back piece, but no updated photo yet. 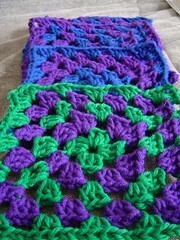 also i joined the granny square knit along where I showed off some of my recent granny squares. Man, these are fun. I still stand by my claim that they are the perfect use of acrylic yarn. And while we are on the topic of granny squares, partners for my granny-square swap-bot swap were assigned today. We ended up with over 20 participants, and I am already planning another swap. stay tuned. 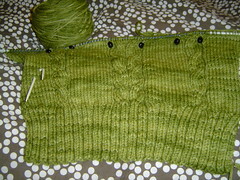 One Response to "Everywhere but here"
The CPH is on my “to-do” list, too… Yours seems to be coming along well!